The five-second rule is a lie. If you’re like me, I bet you occasionally employ the five-second rule. After all, my house is clean! But after reading this study – and hearing the lead scientist admit he wouldn’t eat food dropped on his own kitchen floor – I had to reconsider how clean my house truly was. Yes, I clean regularly. But like most people – regularly could probably stand to happen a bit more often. And because of concerns for my health and the health of our planet, I stopped using chemical cleaning products years ago. Without resorting to harsh chemical cleaners or constant vigilance, I wondered – What would I have to do to make my house clean enough to literally eat off the floor? 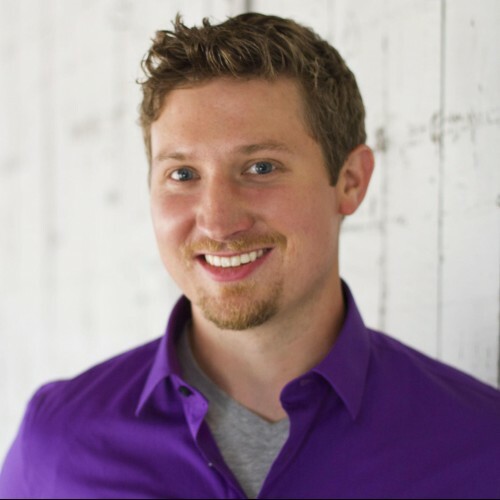 Biofilms: Are They Making Your House Dirty? You know that sticky, fuzzy, yucky feeling you get on your teeth if you go too long between brushing? Some people say it’s like their teeth are wearing sweaters. Those sweaters are actually something called biofilm. 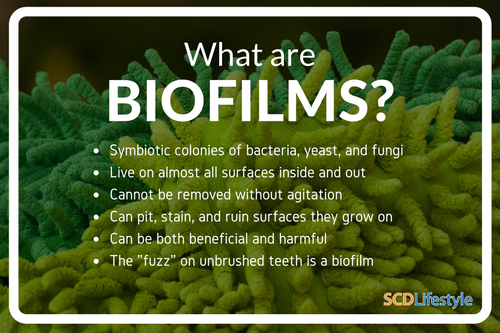 Biofilm is made up of tons of different strains of bacteria that have come together to live in one symbiotic colony. The bacteria cells stick together and form a surface of slime. The biofilm acts as a protective home for bacteria, yeast, fungi, and other microorganisms. Biofilm isn’t just on your teeth – it actually grows just about everywhere – including all over your home. One very common type of biofilm commonly grows in bathrooms and is pink – you may have seen this growing in your shower or toilet bowl and wondered if it was mold. This biofilm is called S. marcescens and despite the pretty color, it isn’t harmless. It can infect open wounds in humans and your urinary tract – not very comforting if you see it in your toilet! In natural environments, biofilms are a very important part of the ecosystem. In my house, however, they are an unwelcome visitor. If your reaction to learning what that pink stuff in your toilet is was to dump a cup of bleach in the bowl, I have some more bad news. Conventional cleaning products not only are dangerous to your health and the health of everyone else in your home (kids, plants, animals) – they also aren’t always effective at removing biofilms. Think about it this way: what gets your teeth more clean – swishing with mouthwash or getting in a thorough brush? We all know the answer is brushing. And just as with the biofilm on your teeth, to clean the biofilm in your house you need more than just a spray of chemicals, as chemicals like bleach or ammonia aren’t able to penetrate the biofilm to kill all bacteria. Biofilms can stain and mar the surface of your household items – like your toilet, fridge, and counters. In some instances, these items are ruined and must be replaced. If you want a shot at removing the biofilm, even with something harsh like bleach, you’ll also need to put in some elbow grease and scrub to disrupt the biofilm. But scrubbing with bleach or other harsh chemicals drastically increases your contact with the chemicals – it can get in your eyes, on your skin, and can be inhaled into your lungs. And trust me – you do not want to prolong your exposure to traditional cleaning products. Some of the most common products – like Lysol Multi-Purpose Cleaner – score an “F” rating from the Environmental Working Group, a non-profit environmental research group. This is due to ingredients like sodium borate, which can cause birth defects and damage to the reproductive system. Even so-called ‘green” cleaners are often not any better. Green Works All-Purpose cleaner also scores an “F” from the EWG. Its high levels of preservatives are linked to cancer and respiratory effects. Keeping your house clean isn’t the only place you’re potentially being exposed to really harmful chemicals. After you’re done scrubbing your toilet with Lysol, you need to wash your hands, right? Cleaners that are designed to come into contact with your skin – like hand sanitizer or antibacterial soap – can be just as dangerous. Just this year, the Food and Drug Administration finally banned the antibacterial triclosan from soap. Not only did the FDA find triclosan to be ineffective (plain soap and water work just as well) – but it is also thought to be contributing to the rise of antibiotic resistant bacteria. It also has been linked in animal studies to immune system stimulation and thyroid problems. But the catch is – while triclosan must now be removed from hand and body soap for consumers – it is still allowed in hand sanitizers, wipes, and hospital settings. This means you’re likely still being exposed. If you’re like me, you probably use hand sanitizer more often than you actually wash your hands..
Healthier Cleaning Alternatives – But What About the Biofilm? For years, instead of chemical cleaners I’ve relied on plain soap, water, and a little help from vinegar and baking soda to keep my house clean. Generally, this works really well. But remember that pink biofilm, S. marcescens, I was talking about before? Well, a few months ago I noticed something pink in my shower – and despite my industrious scrubbing and vinegar-spraying, it just kept coming back. I didn’t want to spend tons of time scrubbing and cleaning my shower – but I also wanted the biofilm gone. Although I knew I wouldn’t go back to bleach, I decided to look for a natural cleaner that was effective for biofilms. So, what was the safe cleaner I found that wiped out biofilms? It’s something you’ve heard of before (and probably use daily): probiotics. It’s kind of hard to remember a time when every grocery and vitamin store didn’t have a huge probiotic section, isn’t it? But just 10 years ago, probiotics weren’t mainstream. Luckily, a lot has changed since then – and with good reason. Probiotics are friendly strands of bacteria that support the native bacteria in our digestive system – and that is really important because our body is made up of 10x more bacteria than the cells. I’ve made probiotics a regular part of my life, both those that come in a capsule and from potent fermented foods like homemade yogurt and sauerkraut. But in doing research, I came across something totally new – the idea that you can use external probiotics to clean and make your indoor environments healthier and safer. Yes, you read that right; probiotics are now being used to balance indoor air and clean surfaces like kitchens, bathrooms, and even on furniture. Cleaners containing live probiotics are able to work their way through the biofilm and clean deeply. How Do External Probiotics Benefit You? I think of traditional antibacterial cleaners like antibiotics for my house. We all know that when you’re sick and take antibiotics, nearly all the bacteria in your gut is wiped out – both the good and the bad. If you take those antibiotics for too long, the bacteria in your gut can become really unbalanced. The result can be gut dysbiosis – where the “bad” bacteria overrun the good bacteria that keep them in check. When you effectively use chemical cleaners in your house (meaning you scrub to disrupt the biofilm), almost all the bacteria is wiped out too – both the good and the bad. Just like in your body, this makes your house more susceptible to an overgrowth of bad bacteria. Repeated use of antibacterial soaps and cleaners – which decimate good and bad bacteria – contributes to the evolution of antibiotic-resistant super-bugs like MRSA. Just like in our bodies, we don’t want to wipe out all the bacteria in our house if we can avoid it – we just want to get rid of the bad stuff. A few months ago, I found out about a new external probiotic cleaner – it’s called Airbiotics. 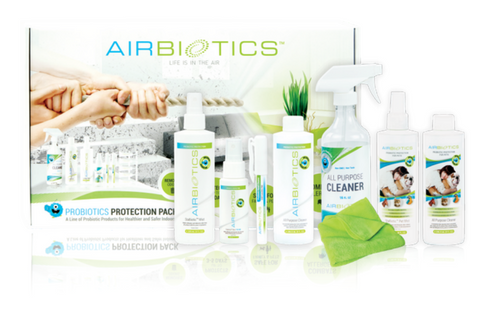 I tried out their 3 main products in my home: Airbiotics All-Purpose Cleaner, StaBiotic Mist, and their hand cleanser. I was interested in trying them because they’re all non-toxic, fragrance and alcohol free, biodegradable – and food-grade! This means if I spray it on my counter and then set food there – it’s ok! If my dog licks something I’ve used the cleaner on, he won’t get sick. Most cleaners – even green cleaners – are toxic if ingested and loaded with fragrances that irritate my lungs, but Airbiotics products aren’t. I use the All-Purpose cleaner on just about every surface in my house – woods, granite, glass, mirrors, and porcelain tile. Since I use it for just about everything, I’m really glad that the bottle is refillable – the cleaner comes as a concentrate you mix up yourself. This means you can make as much or as little as you need and cuts down on the cost as well as the impact on the environment. I loved how easy it was to use (just spray and wipe with a microfiber cloth) and there’s no smell or residue. And what about that pink biofilm in my bathroom? The All-Purpose cleaner wiped it out! The best part is this cleaner continues to clean for 3-5 days after it’s sprayed, thanks to the probiotics it contains. I think of them as my own army of minions, working overtime to keep my house clean so I can relax and enjoy other things. Airbiotics also makes a really nifty hand cleanser – I keep one in my backpack and one in my car – it’s totally unlike any hand cleanser I’ve ever used. It isn’t sticky, oily, stinky or drying – after you spray it on your hands and rub it in, it’s like nothing was ever there. In reality, what’s left are tons of probiotics that help to keep your hands clean and healthy – even if you wash later with soap and water. My favorite product, however, is the StaBiotic Mist. I think of it as the healthy alternative to Febreeze. Rather than putting fake odors into the air that give an illusion of “freshness,” you can spray the StaBiotic Mist on anything that is upholstered (read: difficult to clean). The probiotics in the StaBiotic mist consume the bacteria that produce odor. I used it on my bed, my dog’s bed, a musty chair, curtains and throw pillows, and rather than just masking the smell or covering it, it actually got rid of it. It not only freshens and gets rid of odors – but the StaBiotic Mist’s active probiotics literally eat dust mite proteins. Using the mist has reduced my indoor allergy symptoms like congestion and red eyes. The StaBiotic Mist is a totally one-of-a-kind product that I love. Chemical cleaning ingredients are expensive. Pre-made green products are even more expensive. My vinegar and baking soda routine was cheap and easy. I knew I wasn’t going to trade it in for an expensive, inconvenient solution. Airbiotics doesn’t just clean my house more effectively by using probiotics, it is also really affordable. The cost of the All-Purpose Cleaner is cup-for-cup less than bleach. Buying the All-Purpose Cleaner concentrated means I need to order less often and save on shipping, too. Why Am I Talking About Airbiotics? The team here at SCD Lifestyle is committed to pursuing the best health – through diet and through lifestyle. That’s why, when we come across a product as unique and beneficial as Airbiotics, we want to share with the people we love most – our community. Airbiotics doesn’t just clean your house safely and affordably – it works to keep your house clean and promotes your wellness through one of our favorite things ever – probiotics! I’ve incorporated Airbiotics into my natural cleaning routine and I couldn’t be happier. If you want to try Airbiotics too, you can use this link to try them out and receive 30% off your first order! Questions? Cleaning tips for me? Let me know in the comments below. Can the all purpose cleaner be used on natural stone surface? For example my limestone shower. I only use a scrub brush and water to remove that pink slimey biofilm as all of the cleaners on the market say, “not for use on natural stone surfaces”. Hi Darlene – I know it can be really tricky to clean unsealed stone. My parents have unsealed limestone in their shower as well – and I gave them a bottle of the APC and they used it in there. It didn’t damage their stone and cleaned really well! That being said, I can’t promise what it will do to yours. I suggest you test it in a corner or another inconspicuous area before using it everywhere. I have used it all over the sealed granite in my house and it worked great! Does it help someone who has Candida? Like by replenishing the good bacteria or not since you’re not actually eating it? Hey Rachel – I don’t think these cleansers are a specific treatment for candida. I think if you have candida or other gut issues, using a natural cleanser like this is a WAY better choice than harsh disinfectants. Hey Joanna – we definitely agree! Thats why I recommend Airbiotics rather than anti-bacterial soaps or harsh cleaners like bleach. I am not a “clean-freak” but I think we all agree there is a difference between pink biofilm all over the bathtub and eating produce fresh from the garden! How long does it last? Will the good probiotics die if it sits too long in your cabinet? What keeps it active? Thanks. Could I just empty a probiotic capsule into my water/vinegar spray bottle for cleaning or add some fermentation liquid from my jars of various fermented veggies for a similar effect? Hey Amie – that is an interesting idea and the best answer I have is… I’m not sure! Different strains of probiotics have different effects, so I’m not sure that there probiotics in your fermentation liquid would be effective for destroying biofilms the way Airbiotics are. Hey Diane – I’m glad you’re interested 🙂 It is so cool for me to be able to share what I like to use with other people! Hi would this be effective on mould spores? Hi Jackie – it isn’t specifically designed for mold, but it can help clean mold. Am already using Mother Dirt products which add to your biome, or at least don’t strip away all good bacteria. This sounds right up my alley. Have that pink stuff in my tub too! You state that the StaBiotic Mist will eat dust mite proteins. I’m curious, will it also eat dog dander? Hey Kristy – I asked the team over at Airbiotics and they said YES! Anecdotally, I used it on my dog’s bed and it noticeably freshened it up. Mariel, are there clinical tests results for these products from not only the manufacture of the products but independent labs?